What Comes With The Garage Auto Repair’s Brake Service? When it comes to the vehicle’s brakes, it’s a hard-working system. Their primary function is important to a driver’s safety. It’s also why you must learn how the brake system works, and to be mindful of when your brakes must have maintenance done on them. The brake pads will erode each time you hit the brake pedal. The pads’ metal housing will touch the metal drums or rotors, which produces a safety issue. And, it creates a situation where they’ll need replacing, which can be extremely expensive. Your vehicle’s brakes are going to give you an array of warnings that tell you it must be check out – BEFORE you need them repaired or replaced. You’ll need to use your sense of touch, sight and hearing to help you identify a possible issue. Do you see the brake warning light on while your vehicle is in operation? Does your brake fluid seem low or look dirty? Do you hear screeching or grinding noises when you hit the brake pedal? When pressing the brake pedal, does it feel spongy? Is your vehicle steering (pulling) to one side when you apply the brakes? If you notice any of the following brake system issues mentioned above, you must take care of them right away. If you notice anything else – sensations, sights and sounds – that go on with your brake system, you need to deal with them as soon as you can. Failure to do so means bigger brake problems down the road. Why use The Garage Auto Repair for your brake service? Our technicians are highly skilled in servicing the today’s complicated brake systems. They’ll look over the braking system in your vehicle to ensure it’s working as it should or identify the problem, and present you with suggestions and give you a cost estimate to repair the defect. 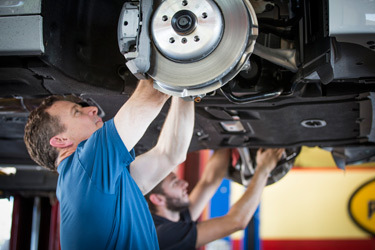 The Garage will make sure to give your vehicle’s braking system and its parts a complete inspection – replacing brake cylinders and brake pads to servicing the rotors. We’ll also carry out your vehicle manufacturer’s suggested routine maintenance such as brake system flush. This will involve air and moisture removal in the brake lines and replacing the brake fluid. It doesn’t matter what the brake system needs of your vehicle are, The Garage can ensure it’s in pristine working condition to ensure both functionality and safety.